The Phoenix Flow Reactor™ is an easy-to-use reactor designed for high temperature and high pressure reactions, enabling the synthesis of novel compounds in a parameter space not achievable with standard laboratory equipment. Its versatility allows the users to create a reaction system that suits the chemistry best. Use the Phoenix Flow Reactor™ as a module of the H-Cube Pro™ for cylinder-free hydrogenations and other heterogeneous catalytic reactors at temperatures up to 450 °C and much more: when the Phoenix Flow Reactor™ is connected to the H-Cube Pro™, it is possible to set up a system to perform single or double-step reactions in series and to monitor and control the whole process using the interface of the H-Cube Pro™. The HPLC pump delivers the starting material solution into the system, which is set to the desired temperature and pressure. The starting material solution enters the selected reaction zone, which can be a loop, a CatCart®, a MidiCart™ or a metal-metal sealed column filled with catalyst, where the reaction takes place. The product is collected in a collection vial. The gas coming from a high pressure gas source (usually a gas tank) is introduced in the Gas Module™, which ensures the accurate dosage of the gas. The HPLC pump introduces the liquid into the system. The gas and the liquid are mixed in the gas-liquid mixer. The gas-liquid mix enters the heated and pressurized reaction zone, which can be a loop, a CatCart®, a MidiCart™ or a metal-metal sealed column filled with catalyst, where the reaction takes place. Product is collected in the collection vial. The HPLC pump is a 10 mL/min capacity unit with built-in pressure sensor (inlet pressure sensor). It is recommended to have an extra HPLC pump if multiple inlets are needed for the application. The Pressure Module™ generates the pressure in the reaction chamber. The module contains a system valve, a pressure sensor and a 3-way valve to set the outlet (to waste or to product collection). The maximum pressure is 200 bar (300 bar for custom request). The Control Module™ allows the control and visualization of the records of any connected modules via a touch screen. The automatic control of the parameters for the whole system plays an essential role in safety. When the Gas Module™ is connected to the Phoenix Flow Reactor™, it allows the introduction of gases, such as hydrogen, carbon monoxide, oxygen, syngas, etc. 14 different gases can be used up to 100 bar pressure, or any gas which characteristics are under the safety parameters of the system, widening the reactor’s chemistry capabilities significantly. It is also possible to use more than one Gas Module™ and mixers to introduce more than one gas at the same time. The Phoenix Flow Reactor™ is a powerful and versatile heating unit capable of reaching temperatures up to 450 °C. A big selection of ready-made reactor setups are available for both homogeneous and heterogeneous applications. Packed bed reactors: Prefilled CatCarts® (30 mm, 70 mm long CatCarts®) and MidiCarts™ are available. We offer empty metal-metal sealed cartridges with fittings from 1/8” OD to 1/2” OD with 125 mm and 250 mm lengths for custom applications. The reactor holder sets are made of four pieces in each case; they are required to fill up the internal volume of the Phoenix Flow Reactor™. Loops: 4, 8 or 16 mL PTFE, stainless steel or Hastelloy loops are available. Custom-made reactors are available as well, for these, please contact us at askthechemist@thalesnano.com. Is it possible to perform gas phase catalytic reactions in the Phoenix Flow Reactor™? Yes. With the help of as many Gas Modules as necessary and with the Pressure Module™, it is possible to perform catalytic reactions in gas phase at high temperatures and pressures. Can I use the Phoenix Flow Reactor™ without connecting it to any other device? No, the Phoenix Flow Reactor™ requires at least a liquid feed and a back pressure supplier to maintain the introduced solvent in liquid phase. It can also work as a module of the H-Cube Pro™. Can I purchase only the Phoenix Flow Reactor™? Yes. 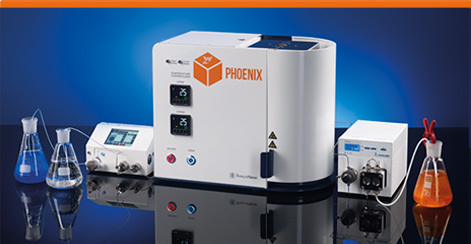 If you are a current user of H-Cube Pro™ or already own a back pressure regulator and an HPLC pump, you will be able to connect the Phoenix Flow Reactor™ to them. What types of chemistry can be performed with the Phoenix Flow Reactor™? Both homogeneous and heterogeneous reactions. Can I pick from the different elements only those that will be useful for me? Yes. It is possible to create a completely customized system that fits your own needs. Talk to our application chemists (askthechemist@thalesnano.com) to find out what would be the perfect configuration for you.